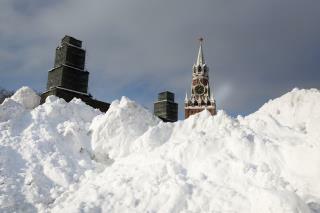 (Newser) – It's been a particularly brutal winter in Moscow, complete with record-breaking amounts of snow, and municipal workers haven't exactly been on top of removing the piles of white stuff. So city residents had to get creative—and political—in their efforts to clear the streets, per the BBC: They spray-painted the name of opposition leader and Putin basher Alexei Navalny onto the snow. The ploy has appeared to somewhat work, with some saying city workers came out "within hours" to deal with the graffitied snow. In Russia, snow plows you.